So... I should be working on my homework for yoga teacher training right now... but since we get the keys to our new apartment tomorrow(!!!!! ), pretty much all I have on the brain is IKEA. My enthusiasm for that store may be a tad overwhelming sometimes, and I realize that not everyone is lucky enough to have one nearby, but IKEA is part of my abode-history. Half of the stuff in my parents' house growing up was from IKEA, in fact, we took frequent trips there as a family. It's also where I went when I moved into my first apartment, and each and every single one after that one... so my love for IKEA goes way back. Needless to say, whenever Shawn and I are looking for anything house-related, 99% of the time IKEA is the first place we look. We've been daydreaming about the new apartment, and now that move-in day is within fingertips reach, we can finally make our daydreams reality. Since we're pretty good on furniture and don't currently intend to buy any more (minus some for the balcony, and possibly a new bed/mattress...) I thought it'd be nice to focus on the little things that help freshen up a new spot. 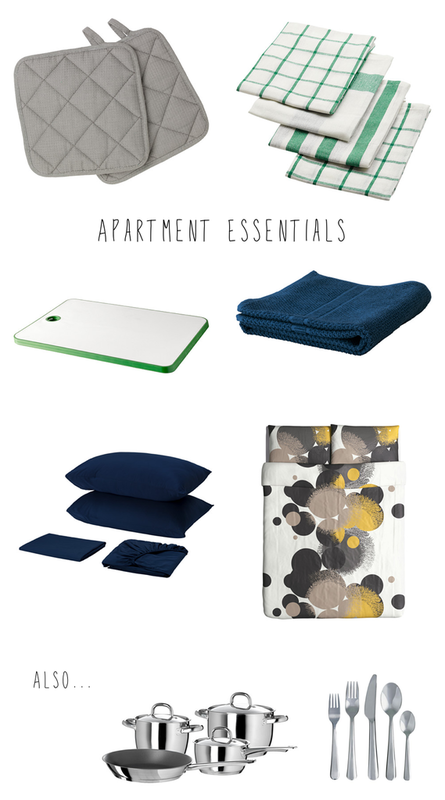 Here's a list of (what I believe to be) essentials for a new apartment. Essentials being, pretty much anything that isn't furniture. Or, more specifically, anything that gets a lot of use and could probably stand to be replaced every year or so. Potholders: You know, those grimy squares you use to pull roasted vegetables out of the oven, or to keep your lap from getting hot when you're too lazy to eat at the dinner table? Yeah, those somehow manage to get close to all of the most epic kitchen messes, and yet they never get washed. I think it's time to buy some new ones. Dishtowels: Yeah, those get pretty messy too. And even though you remember to wash them will all your other linens, somehow they still start to fray after 6 months and then you find a random hole in one.... hm, I think replacing these every year isn't too much to ask. And you can use the beat up old ones as cleaning rags! Cutting boards: Sure, the wooden ones are prettier and they last longer, but they're porous and that leads to all sorts of potential issues that I don't trust my particular roommate to be aware of (ahem... raw meat), so we stick with plastic and just replace them once they're well worn - usually every year... we do a lot of chopping. Towels: Our bath towels and hand towels get a lot of use because we purposefully only have one set. Mostly because we haven't had room to store any extra towels. Plus, having only one set forces me to stay on top of laundering the linens, because let's be honest, I don't do that nearly as often as I should. So new towels every year or two? Sure! Sheets & duvet covers: Unless you shower every night before bed, sheets get gross fast. These are another thing we only have one set of, also for lack of space, so they get a lot of use. Duvet covers probably don't need to be changed as often, but they're still fun to get. They'll make you excited to hop into bed! Pots & pans: We aren't at a point in our lives where we can spend a lot of money and get some super-quality cookware yet, so we've been buying mid-range cookware that, with heavy usage, generally lasts us about three years. We are due for some new pots and pans... especially a big pot! Our biggest pot right now only holds 3 1/2 quarts! Silverware: Certainly not something you need to get every year, but every few years it's nice to switch it up. We're still using the same wooden-handled set we bought back in 2010, and they're looking a little worse for the wear. Plus, we seem to have lost two forks over the years, so it's time for a change. Is there anything you would add to the list?